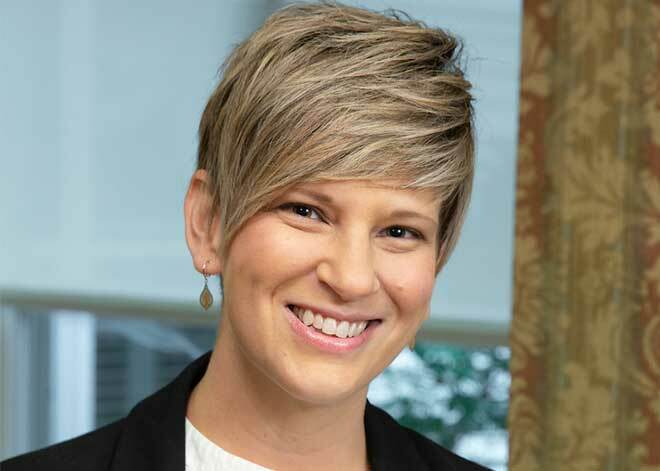 LeaAnn Blanchard, of Southington, was named the new executive director effective Oct. 1 of The Orchards at Southington, an assisted and independent senior living community located at 34 Hobart St.
Blanchard was named executive director to replace Audrey Vinci who retired on Sept. 28 after 15 years at The Orchards. Blanchard has been a familiar face at The Orchards since she was hired as the resident service coordinator in December 2016. In that position she worked worked closely with residents and families, connecting them to services including veterans benefits, state programs and mental health services. She was the staff social worker and facilitated the Sunshine Club and Blankets for Babies. She also introduced the Joy through Laughter Club, showcasing the benefits of laughter, a program she offers to residents and at area senior centers. Blanchard, who is married and has three children, enjoys family time and travel. She keeps life positive and upbeat by embracing her mantra and encourages others to do the same: “Life is better when you’re laughing,” she said. Note: Blanchard will be presenting “The Joy through Laughter” on Friday, Nov. 2 at 10:15 a.m., at The Orchards at Southington. To RSVP, call her at The Orchards at Southington, 860.628.5656. The Orchards at Southington offers independent and assisted living, and is a not for profit member of Hartford HealthCare Senior Services. For more information about The Orchards at Southington, visit //southingtonorchards.org.